No worries. I was on the wait list for the instapot and one happily became available on Thursday! Thanks again! Hopefully the ones in this book are great too. Also, I had NO idea about birding, so I'm hoping the stuff inside is useful! I still have a number of you who are not responding to my private messages. Please take the time to respond to me ASAP or I will assume you received all your gifts. It does look like I will need a few people to step up and help out again. I will, of course, take a few delinquents even though I do not send/receive any gifts during this season... but could use some help. Message me if you are willing to help and let me know if you would be open to shipping outside the US. Look forward to another great year and again thanks guys! FlyingCow and b00mer89 like this. 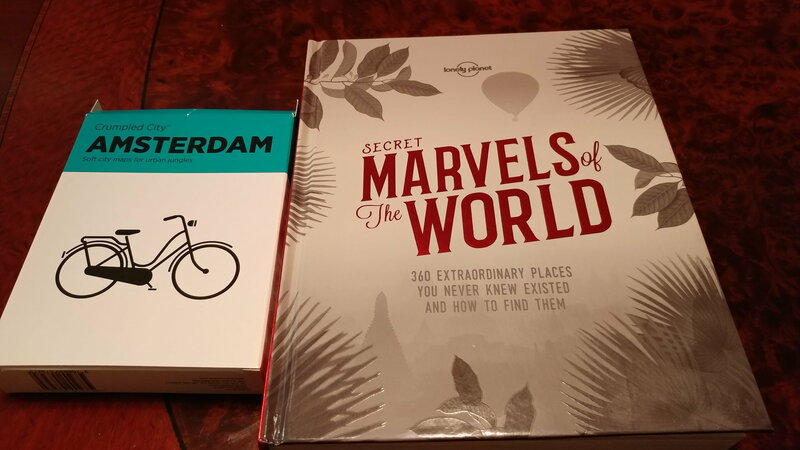 I received gift 3 of 3 yesterday: Thank you to my Secret Santa (unidentified), with nice gifts related to my wife's and my interest in traveling. The Amsterdam Crumpled Map is printed on a very flexible material, with a nice map of Amsterdam. The Lonely Planet "Secret Marvels of the World" will help us find new places to visit! Warm thanks to the Secret Santa giver! Milz02315 is my hometown hero! The hot chocolate will hit the spot during this winter chill. Bourbon infused seasonings and quality oil and balsamic will make for some interesting culinary experiments. 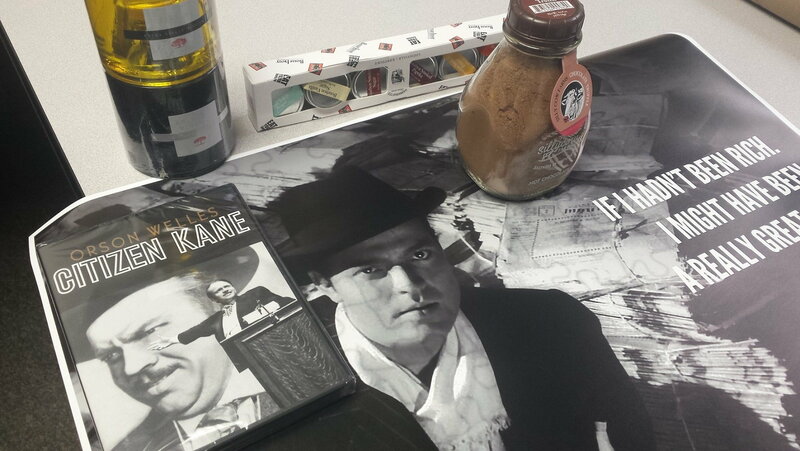 Citizen Kane is a great addition to daughter's collection. We listen to some of the old "Shadow" and Mercury Theater recordings on long trips, so she definitely knows the voice. The poster will find a home next to Audrey Hepburn on her wall. Thanks so much!! 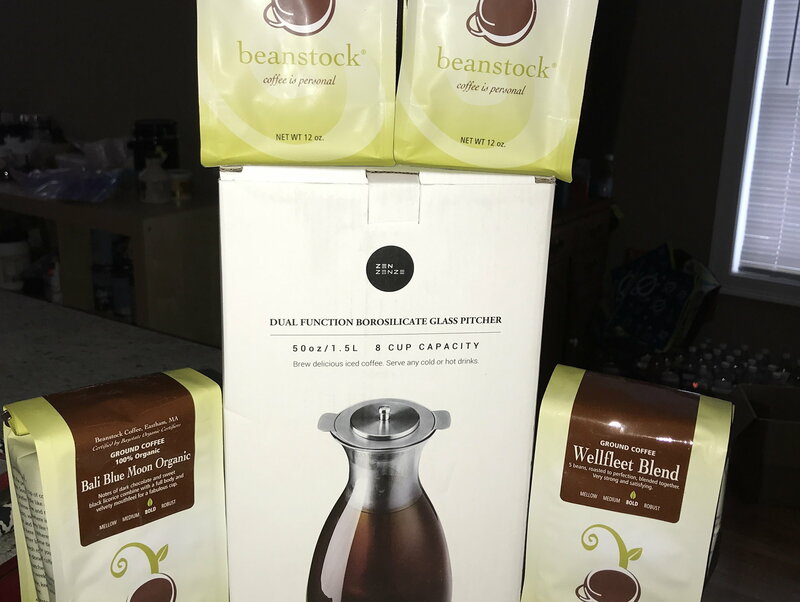 Glad you like the coffee gifts! Whew!! It has been a whirlwind week! How so many of you host family for extended periods during the holidays I'll never know. LOL. I love them, miss them already, but thank the heavens they're gone and I can go back to my typical routines. First, I want to thank all my Santas. At least two of you I will hopefully be requesting next year because I need to repay the favor and thoughtfulness. This year was hard for me, I lost my mother (about 8 days from now it'll be a year), we had turnover at work, home issues, etc. I typically join in on this because I don't usually get to be with my family for the holidays- this year was the first in nearly 8 years- and the sending of joy helps a little. 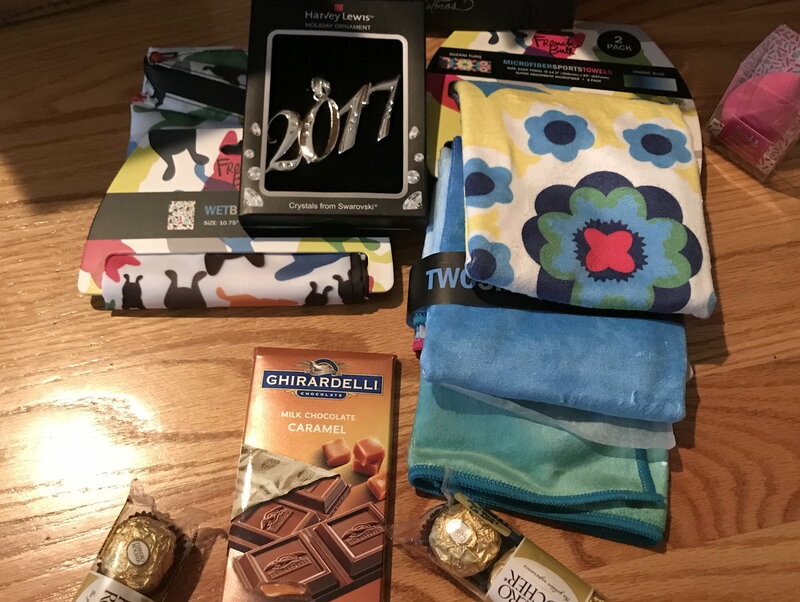 So thank you to all of you who were my Santas. Even though I'm late- know that you put a smile on a very stressed out face on Christmas afternoon. To my Santees, I hope you all enjoyed what you received. Some of you were a bit more challenging to shop for than others because I had to educate myself about your interests first, but I truly hope everyone enjoyed what they got. I tried hard to send things I thought would be useful and that you'd enjoy. Now, without further ado, the presents I received. 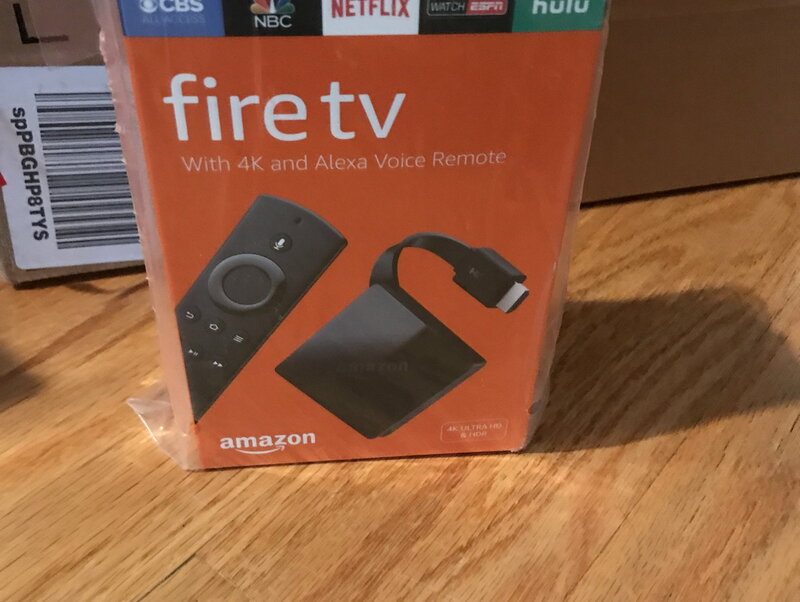 I received two Amazon Fire TV's and was humbled to open them. I put them on my list as a whim, not thinking anyone would get me one- and lo and behold I got two. I'm only showing one below b/c well, what's the point of reposting the same picture? 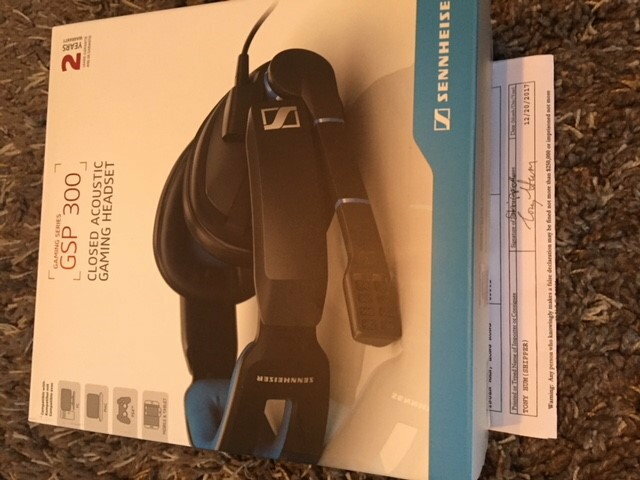 Next, I received a lovely box from a Santa who must've guessed based on the things on my gift list (new cycling/spin shoes, cycling gloves, a Schoshe HR monitor, etc) that I was someone who likes to break a sweat now and again. This was very perceptive. I didn't do the list that way on purpose, those were things I truly needed or wanted. I tried to make the list easy and affordable for those who were buying for me because the holidays are stressful for everyone. I don't ever want to be a burden for someone doing something nice for me. So imagine my surprise when I look inside to find a nice ornament, FR chocolates, a Ghirardelli bar (love this flavor- good job Santa), a makeup blender (I don't wear it, wonder what else I can use it for? ), a wet bag for the gym (will come in handy when I travel- that last morning with wet bathing suits was always a challenge ), and microfiber sweat towels. I was in awe. I actually used one of the towels this morning on my Peloton (that was my gift to myself this year- hence the aforementioned requests on my wish list) and it was SO SOFT. I use them on my car, but have never had one for me. Oh! I nearly forgot! This box had a lovely Hallmark card inside!! 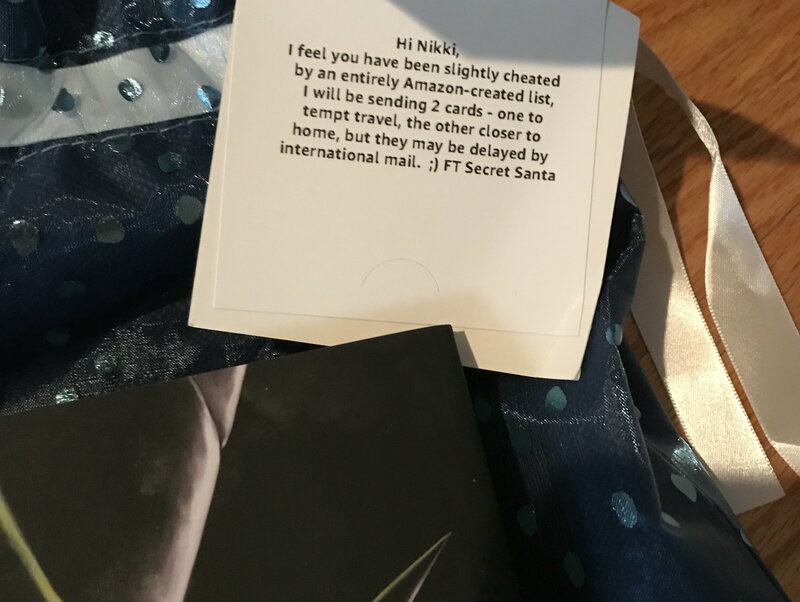 My 5th gift was from another very very thoughtful Santa, who literally gave me chills reading the gift notes they sent. Thank you so much Santa. Inside was a book I'd requested from a series someone else told me about. 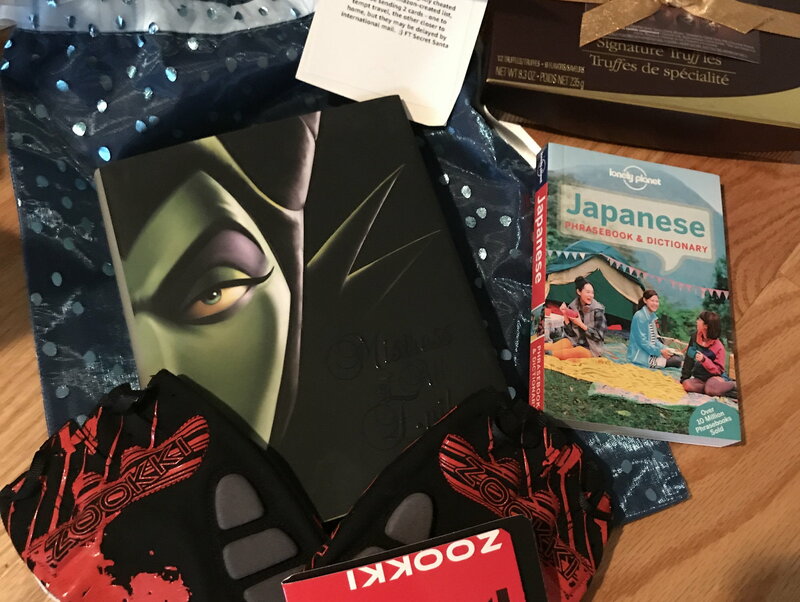 I don't know how Santa knew, but they picked my fave villain of the four (it's a tie with the evil queen but miss Maleficent edges her out a skooch). That alone just touched me. Then, there was a Japanese phrasebook. Japan and Hawaii are my favorite places on earth. And while I haven't been as many places as most of you- I've seen my fare share of places. I would be in Japan right now if I could. But, I don't have any immediate travel planned anywhere for next year. I just mentioned in my 'about me' that I was hoping to get back to Tokyo in 2019. So thanks again Santa- I appreciate it. I also got a box of Godiva (yummy yummy for the tummy!) signature truffles from this Santa. And lastly, a pair of cycling gloves. I think they were on my WL, but I can't remember. What gave me chills is the note on one of the gifts. I'll post a close up below. I have NO idea what's coming, but I'll be sure to post when it arrives. SPerkins921-I am just catching up on Flyertalk now after the holiday business. I am so sorry about your Mom and about the rough year. Hope that in light of the snows blanketing New England today that the coffee brought some wamrth into your home! I'm not sure if this idea would gain any traction, but I think it would be great fun for Flyertalkers to participate in a Secret Santa Christmas in July version. What would it take to make that happen? Redhead, Tpa-flyer and aquamarinesteph like this. Just double checking to see if you still need volunteers. Lol! I see your point, and while amused, my friendly reply is, uh, no. 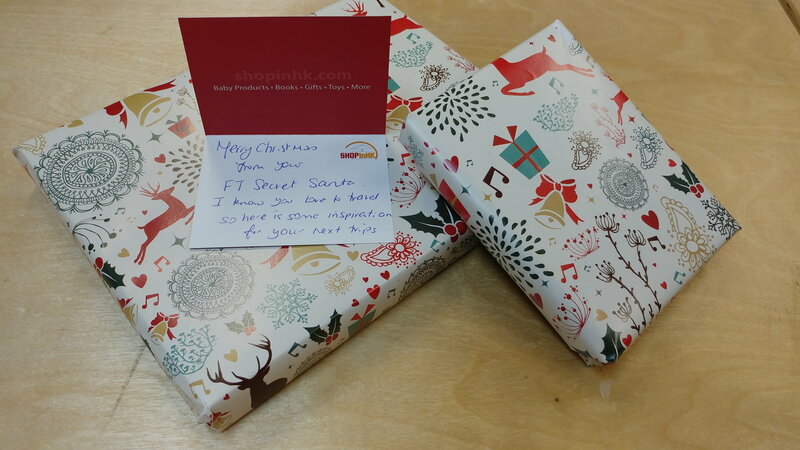 I have no idea if one of my Santees received her gifts. Amazon said they delivered, the Post Office said they delivered, but she's never posted! Received a motorcycle lamp and a national parks monopoly game. Kids will love it. Thanks! 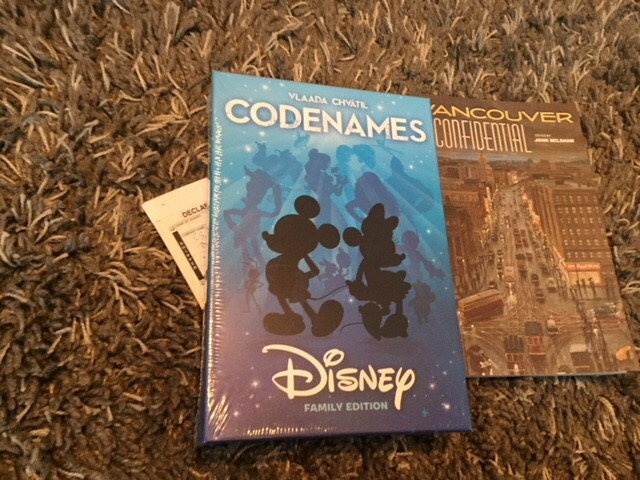 Thanks to my Secret Santas. I received a beautiful oil painting from my SS in Limerick, and a couple pictures, which I assume come from my second SS. All three pieces adorn my apartment now.